Each mini figure is carefully sculpted and finely painted by hand to ensure optimum quality for years of learning fun. For added play value this collection is packaged in a reusable acetate tube. Figures range in size from 2.5 to 3”. All figures are phthalate and lead free to ensure your child’s safety. Prehistoric crocodiles thrived in the wetlands of the ancient Sahara 100 million years ago. The first specimens of these prehistoric creatures were called Sarcosuchus. Our miniature models realistically depict these ancient beings. 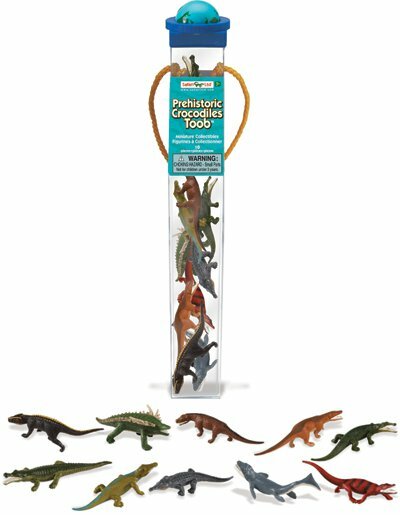 This Toob® includes a Postosuchus, a Desmatosuchus, an Euparkeria, a Montealtosuchus, a Champsosaurus, a Sarchosuchus, a Chasmatosaurus, a Rutiodon Validus, a Dakosaurus and a Pristichampsus. Educational leaflet included for your learning pleasure. Category: Dino Toys, Plush & Merch. Tags: crocodile, prehistoric, safari, toob.